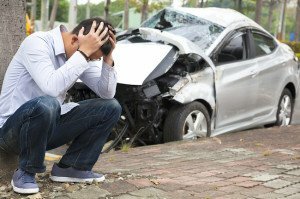 So you are in an auto accident and it is not your fault! What are you supposed to do next? Here’s a checklist for anybody involved in a car accident to ensure that you’ve covered your legal bases. Car Accident Checklist #1 – Is Everybody Safe? First, make sure you and your passengers are ok – if anyone needs medical attention, call 911. Getting help for anyone who is hurt is the immediate priority. If you are seriously hurt, get an ambulance and go to the hospital. They will assess your injuries and start the process of caring for you. Car Accident Checklist #2 – Should You Call the Police? Assuming you do not go to the hospital or that the trip to the hospital is delayed, you will still be at the scene of the auto accident. Usually someone has called the police, and they will arrive to talk to everyone. Later, they will compile the information from their investigation into a “police report.” Do you have to call the police? The answer is no. In addition, you can always walk into the nearest police station and make a report. However it is usually a good idea to get them to the scene of the accident because you just never know what the at-fault driver will say. When the police arrive to the scene of the auto accident, remember that everything you say will be written down and can appear in the report. After an accident adrenalin is running high, so take a minute to breathe and get calm before you talk to anyone. When you talk to the police, just answer their questions. Be as brief as you can while providing truthful information. The reason for this is medical — while you may not immediately feel like you were hurt, very often you don’t feel the pain or other effects of the collision until the next day. Therefore if you quickly tell the officer you are not hurt, as many people do who are just “trying not to be a bother,” it will go in the police report and won’t you help later if you do start to feel poorly, as often happens. It would be better to say you are not sure and that you feel you may need to go to the doctor or hospital. Once statements have been taken and your car was towed (if necessary), make sure you have the other driver’s contact information and insurance information. Also, the police often give you a piece of paper with the report number on it, so be sure to save that. Assuming you did not go to the hospital by ambulance after the accident, you now have to decide how you feel. If you are concerned you were injured, go to the hospital or your doctor ASAP. Once you get there be sure to tell them everything that hurts; if you leave something out, the other driver’s attorney might later try to claim that it was not injured in the accident, so be thorough. Car Accident Checklist #6 – Which Insurance Do You Use? The next and often most-confusing question is “what insurance to give the medical provider?” One thing to know is that the auto insurance of the other driver is not going to step up and pay the medical provider directly. At some point they might make a “PIP” or “no-fault” medical bill payment, but that or other medical bill reimbursement normally only happens much later, including when the whole case is finally resolved. Therefore always give the medical provider your health insurance and/or Medicare/Medicaid information. If you don’t, the medical provider will initially send the bills to the other driver’s insurance and, when they are not paid promptly, will initiate collection activities against you. This leads to you receiving collection letters and can negatively affect your credit. So if you have health insurance, give it to the provider. If this all sounds confusing, it’s because it is! But you want to make sure your bills get paid. Car Accident Checklist #7 – Pursuing a Claim/Do You Need a Lawyer? Finally, there are questions about when and how to notify the other party’s insurance company, and whether to notify your own carrier. An attorney who deals with many personal injury claims is an invaluable resource for pursuing your claim and handling the many details associated with it. Our law firm will help you through this maze of issues and potential traps – we suggest getting ahold of us very soon after your injuries occur.